Located one hour south of San Francisco and thirty minutes north of Santa Cruz, at the edge of the coastal town of Pescadero, the Inn is a 100 year-old farmhouse containing three rooms, each with private bath and clawfoot tub, a parlor with a large fireplace and a two room cottage overlooking the creek and gardens. Downtown shops offering exotic clothing, locally made furniture and unique gifts are a short stroll away. Duartes Tavern, a family owned business in operation since the mid-1800's offers fantastic artichoke and chile soups, homemade pies and it's renowned Crab Cioppino. The recent winner of the James Beard award 2003 American Classics Restaurant, people travel from miles around to enjoy the unique experience. It is two miles to the beach and three to the redwoods. Local country roads offer excellent bike riding opportunities through the countryside. Come enjoy the unspoiled nature and serenity of old California. 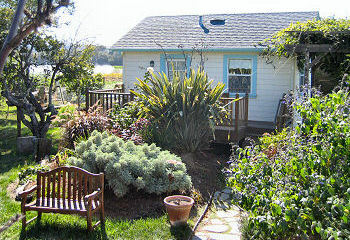 This and other San Francisco Bed and Breakfast Inns can be found here online in The Register.